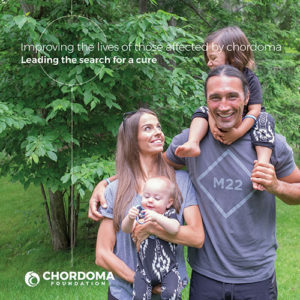 The Chordoma Foundation is a nonprofit organization working to improve the lives of those affected by chordoma and lead the search for a cure. We envision a future in which everyone affected by chordoma is able to overcome the disease and maintain their quality of life. Chordoma research has advanced dramatically: from knowing virtually nothing about the disease to 7 promising drugs entering clinical trials. We have built a network of more than 400 chordoma specialists across the world, including nearly every leading chordoma treatment team in the U.S. and Europe, and produced clinical guidelines for diagnosing and treating chordoma. The Foundation has become a trusted resource for thousands of chordoma patients and their caregivers across the world, with a growing suite of services designed to meet the unique needs of the chordoma community. But what gives us the most hope is that the ground we’ve gained thus far has made it possible for patients to begin benefitting from advances in research in a matter of years rather than decades.